Last week, the UN published the 2017 ‘SDG Progress Report’, intended to provide a global overview of the current situation of the 2030 Agenda in advance of the High-Level Political Forum (where States will gather in New York to report on their SDG implementation). The report presents stark evidence – not of SDG progress, sadly, but of the glaring gaps and flaws in the way such progress is defined and measured at the global level. It unfortunately confirms the fears of many in civil society that the ambitious spirit of the 2030 Agenda would be undermined by the weakness of the ‘official’ monitoring and reporting arrangements. The progress report gives a highly partial view of SDG progress or setbacks, and offers little in the way of holistic insight. Inadvertently, it sharply illuminates why the right indicators are so important, and why indicators – even good ones - are meaningless without contextual analysis. There is no consideration or acknowledgement of the geopolitical or economic context we’re in – austerity measures continuing to sweep the globe, the refugee crisis continuing unabated, multilateralism under threat and nationalism on the rise. Most frustratingly, it warps the already-flawed indicator set to skate over politically contentious elements of the agenda and stick to the ‘safe’ issues and measurements that are unlikely to cause pushback from Member States at the UN. Some gaps were to be expected, because the indicators for many of the goals and targets are currently categorized as ‘Tier II’ or ‘Tier III’, meaning that data and/or methodologies are not readily or regularly available yet. Yet, there is a self-fulfilling, politically convenient circle here. Most of the Tier II and III indicators are intended to measure the newer, more ‘transformative’ targets of the agenda. They are Tier II or III precisely because governments said they were unable (or unwilling) to measure them yet and they weren’t in the MDGs – although in some cases civil society has proposed sound methodologies. The report inadvertently fuels the suspicion that what is measured and what is excluded has as much to do with politics as with technical limitations. At several points, information is included on targets which have Tier II or III indicators – but only where the targets are not politically contentious and do not necessitate systemic change. For example, under Goal 10 there is a target on remittances (target 10 c.) with an indicator labelled as Tier III. And yet, in the SDG Progress report, one of only five points on Goal 10 is dedicated to remittances (everyone’s favourite apolitical effort-free development finance ‘fix’), using proxy measurements to assess the current situation. Why couldn’t this be done for other targets? It seems all too likely that political considerations and fears of pushback have influenced these choices. At the same time, some targets with Tier I indicators (internationally established methodology, data regularly available) go conveniently unmentioned. So for example, the contentious but all-important target 10.4 on achieving greater equality through fiscal, wage and social protection policy has a Tier I indicator (‘Labor share of GDP, comprising wages and social protection transfers’). And yet: no mention in the report. We at CESR along with partners called for a more holistic set of indicators for 10.4, so it is particularly galling to see even the compromise indicator not being measured. Similarly, target 17.1 calls for strengthened domestic resource mobilization, including through tax, with one Tier I indicator focusing on the proportion of the domestic budget funded through taxes. It is not mentioned at all in the report, with the only two points in the ‘Financing’ category of the Goal 17 section devoted to ODA and – yes, you guessed it - remittances. The ‘Systemic Issues’ category features one point on so-called ‘development effectiveness’, a concept which is not even included in Goal 17 (the systemic issues it does include are policy coherence, macroeconomic stability and policy space). On the topic of systemic issues: under Goal 16, there is nothing on illicit financial flows because the definition and methodology is being battled over in profoundly political ways. Goal 8 is another prime example of the exclusion of rights-based targets from the report. Among a raft of targets premised on the business-as-usual model of economic growth, Goal 8 includes three targets that align with human rights, including an explicit call to protect labor rights (8.8): all overlooked in the report. In fact, the only time workers are mentioned is in reference to their (slowed) productivity, even though labor rights compliance (indicator 8.8.2) is a Tier I indicator. Indeed, throughout the report the targets which are invisibilized are those that are most rights-based. Yes, there are issues around data availability and methodologies, but as the work of CESR and others has conclusively shown, it is possible to monitor and measure rights enjoyment. The gaps and flaws in this supposedly authoritative report matter not only because it paints a skewed or misleading picture about how SDG implementation is proceeding, but also because it obscures some parts of the agenda, and hinders any form of accountability. Both of these effects are convenient for the political forces who want to cherry-pick the SDGs into oblivion while delivering more of the same neoliberal, top-down policies that even the IMF now admits have only resulted in increased inequality and insecurity. It underlines the urgent need for robust independent/civil society monitoring and vigilance over the SDGs. The forthcoming 2017 edition of the civil society Spotlight on Sustainable Development Report, which CESR has helped to put together, will be one important contribution to this burgeoning genre. It also creates even further impetus for meaningful and innovative monitoring processes at the regional and national levels, as well as for greater exploration of how human rights monitoring bodies can provide an alternative space for SDG accountability. The divorce from reality and retreat from human rights-based discourse exhibited in the Progress Report is unfortunately becoming a trend in discussions around sustainable development. At the Financing for Development Forum recently, siloed thinking was on prominent display. For example, there was no mention of austerity despite the fact that public spending contractions are now expected to affect nearly 80 per cent of the global population by 2020. Meanwhile, many countries continued to evangelize about the potential of private finance, leaving it to civil society to voice their alarm about issues of transparency, accountability and human rights. There is much work to be done, and urgently. 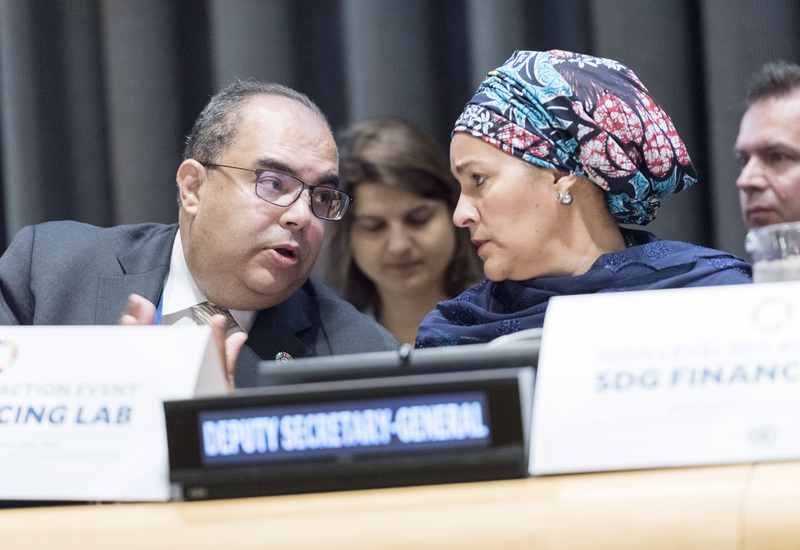 Regrettably, the SDG Progress Report and the FFD Forum have underlined that the transformative, universal, integrated agenda we were promised is so far a chimera. Learn more about CESR's work on the Sustainable Development Goals. Matthew Annunziato, CESR Graduate Research Intern, contributed to the drafting of this blog post.